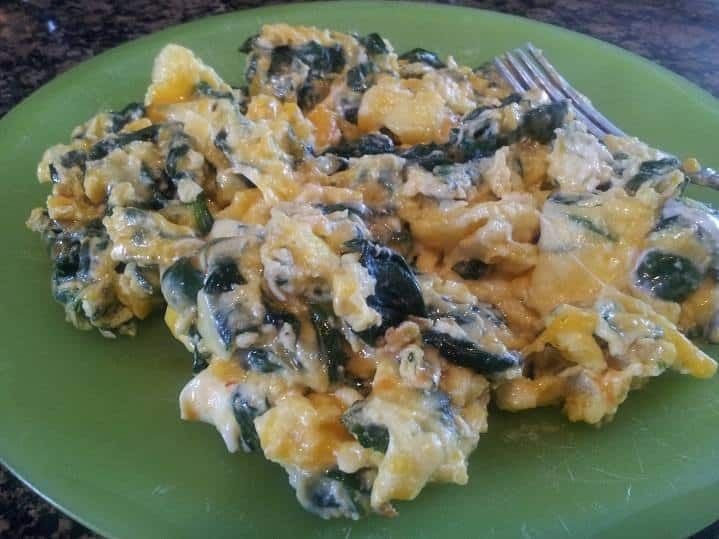 This breakfast idea is spinach and cheddar scrambled eggs from the ketogenic recipe site Ruled Me. Incredibly simple, nutritious and yummy all at the same time! The ingredients are simply spinach, cheddar, eggs, olive oil and cream. I highly recommend this style of meal as a quick and simple, no fuss meal option regardless of whether your goal is weight loss, normalising blood sugar, or nutritional density. The nutritional analysis below shows that this recipe scores very well in both the nutritional balance and protein quality while still only having 6g net carbohydrate for a 500 calorie serving. that’s almost a kilo of spinach!